Forming the southeast corner of Canyonlands National Park, the Needles District is known for its colorful sandstone spires, challenging backcountry roads and extensive trail system. 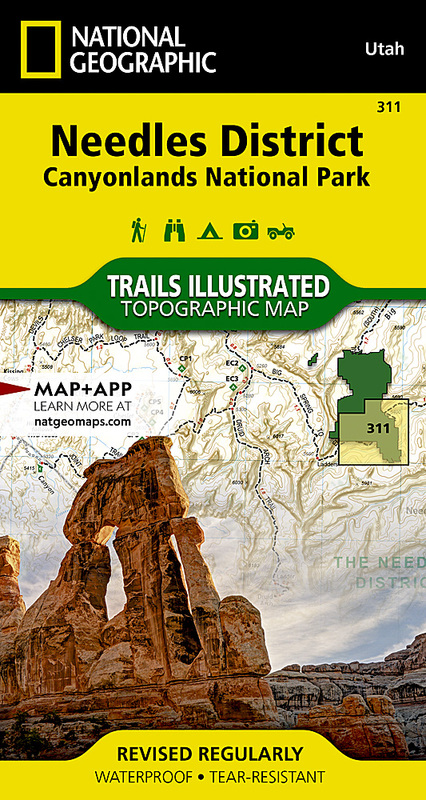 Expertly researched and created in partnership with the National Park Service, Bureau of Land Management and others, National Geographic's Trails Illustrated map of Needles District is a complete travel guide to this section of the park and neighboring Dark Canyon and Butler Wash Wilderness areas. The provided backcountry regulations, permit information and safety tips will assist in preparing for your adventure. The hiking trail and backcountry road guides, with route descriptions and mileage, will help you chose the most suitable path. Navigate the area with clearly marked trails and backcountry roads that include mileages between intersections. To assist you, the map base includes contour lines, elevations, shaded relief and water features. River mileage on the Colorado River is noted as well, for those exploring by boat. Mountain bike routes are marked with their degree of difficulty. Some of the many recreation features are campgrounds and campsites, scenic overlooks, and boat launch sites. Other features found on this map include: Canyonlands National Park, Glen Canyon National Recreation Area, Green River.